You can control the start day of a week through the setWeekStartDay (see the details). To hide the week number column, use the hideWeekNumbers() method. 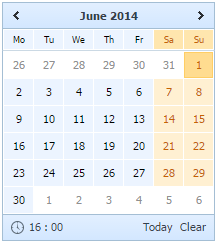 You have a possibility to set holidays in calendar. The way holidays are rendered in calendar is determined by the CSS file. To set a date as holiday you should use the setHolidays() method (see details). Use the methods disableDays(), setInsensitiveDays(), setSensitiveRange(), setInsensitiveRange() to set insensitive/inactive dates in calendar (such dates are dimmed). //all dates starting from June 08,2011 will be dimmed.Dates until June 08,2011 will be active. //all dates starting from June 08,2011 will be active.Dates until July 08,2011 will be dimmed. //June 10,2011, June 17,2011, June 18,2011 will be dimmed.All other dates will be active. If a date is set as a string, it should correspond to the format specified with the setDateFormat() method. You can show Today and Clear buttons on the calendar next to the time. 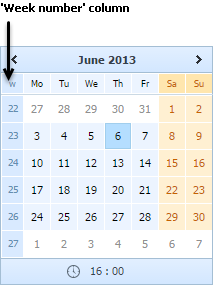 By clicking the Today button, the calendar sets selection on the current day. A click on the Clear button will clear the selection of date. To hide the buttons, use the hideToday method.